Shorespeare is loosely based on a Midsummers Night Dream. Shakespeare, with the help of Cupid, has landed at the Jersey Shore. Cupid inspires him to write a play about two New Jersey sweethearts, Cleo and Toni. Shakespeare is put off by their accent and way of talking, but decides to send the two teenagers on a course of true love. Toni and Cleo are determined to get married right after they graduate from high school, but in order to do so they must pass this course of true love that Cupid's pixies create and manipulate. As they travel along the boardwalk at the Jersey Shore, Cleo and Toni, meet a handful of historical figures disguised as the carnies. Confucius teaches Cleo the "Zen of Snoring," Charles Ponzi teaches them the importance of "White Lies," Leonardo Da Vinci shows them the "Art of Multitasking," and finally they meet Napolean who tries to help them to "Accept Shortcomings" of each other. After going through all these lessons, the sweethearts decide that marriage should wait, and Cupid is proud of Shakespeare who has finally reached out to the modern youth. Leslie Tanner teaches science and drama at Henley Middle School in Charlottesville, Virginia. She grew up in Mendham, New Jersey, and received a B.A. in Theatre Arts from Davidson College, in North Carolina. In her early career Leslie worked at the Goodspeed Opera House in Conneticut learning scenic design and the backstage world. She also has directed plays and taught theatre classes at the All Children’s Theatre in Providence, Rhode Island and Spectrum Arts Camp in Charlottesville, Virginia. 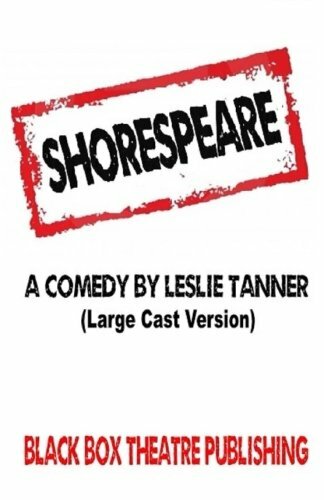 Shorespeare is her first published play, although her “tweet” idea became the winning play for the Playscripts, Inc. Pitch ‘N” Play playwriting contest (2012). Leslie is also an ebook author of a children’s book, Power of the Sun.